2 Beds 2 Baths 1,248 Sq. ft. Description: Clean & Neat! 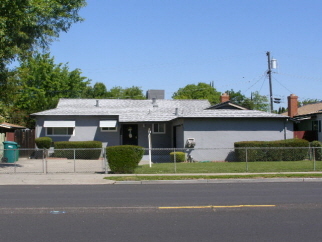 Contemporary 2 bedroom (could be 3) 2 bath home located in Nightingale Manor of south Stockton. New (25 year) composition roof, new central heat/air and new range & oven. Combo dining/family room could be used as 3rd bedroom if necessary. Large 2-car garage, covered patio, lots of concrete and fully fenced back yard.